Writing a personal or professional biography is one of those tasks that most of us dread. What to include, what to leave out? Often it seems easier just to ignore the task until another day. But at the same time, we all know that a great work bio is a necessary document these days. One way to make this dreaded task easier is to use a fill-in-the-blank biography template. When you use the templates provided below, all you have to do is choose one or two sentences from each of the four categories and add your details. The result will be a great short bio. To structure your bio, choose one or two sentences from each of the four categories below. I’ve organized the bio sentence templates below into the four “who, what, why, and how” categories. Choose one or two sentences from each category, fill in the blanks, and you’ll be done! A big believer in ______, NAME supports _______. NAME is no stranger to ________ (your industry or type of work), having spent ___ years as a ________ and a __________ (occupations: e.g. board member, speaker, fitness instructor, computer support specialist, entrepreneur, chef, senior executive, where he/she ____________ (your major responsibilities or accomplishments in that role). Prior to starting his/her _________ (type of business) business, NAME spent _______ years as a ___________ and a __________(your relevant experience). NAME specializes in _________________ (your area of specialization, e.g. marketing and social media; presentation coaching; multicultural awareness; leadership training) and has successfully served a range clients, including ______, _________, and ________ (range of clients served, e.g. entrepreneurs, corporate professionals, nonprofit organizations, CEOs). ____________ (your name) is also the creator of a/an ____________ (name of something you have created, e.g. conference, forum, website, application) which is ___________ (choose one: enjoyed; frequented; visited; read) by _________ (number e.g. hundreds; thousands; many) ____________ (who enjoys it, e.g. visitors; participants; registrants) each ________ (time frame, e.g. month; year). After a successful career in __________ (what you’ve been successful in), NAME now coaches/teaches/advises (choose one) other people how to achieve the same success. NAME is available for private consultations on ______, and can be reached at (PHONE NUMBER or other contact info) or by email at ______. 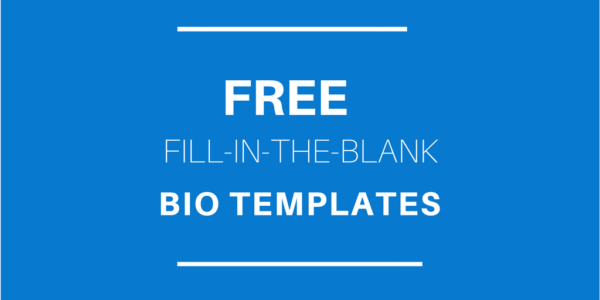 Use these bio templates as a starting point but try not to feel constrained by them. If there’s something that you think is interesting or important to add, by all means do so! Trust your own judgment and let your personal or professional bio reflect what is unique about you. If you don’t feel confident about your writing, or you’re simply in a hurry… go here to get an in-depth professionally written “fill-in-the-blanks” bio template that is specific to your type of job. You’ll have it written and complete in less than 30 minutes.